Eclectic mix of essays in Beyond the Map is sure to have something for everyone. How unique islands are formed and claimed is described in Part I. Part II is about how some small nations and communities were developed. Part III describes utopias of religion, lifestyle, or technology. Part IV and V deal with haunted and hidden places respectively. I thought that Parts I and II were rather dry and slow. Geology and politics are not my favorite subjects. However, I’m glad I kept reading because Beyond the Map’s later parts were really interesting. There is a succinct essay about ISIL that is marvelous. Several of the utopias are tourist attractions that I would love to visit. The haunted places of Part IV are more urban legends and ‘psychogeography’ than ghost stories. Still they are interesting short essays. 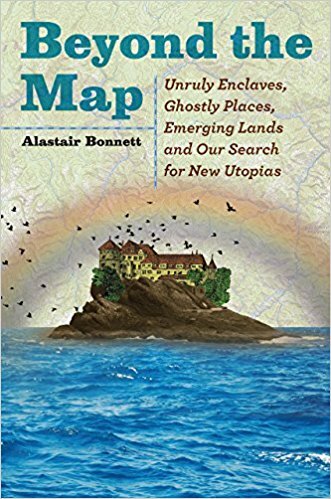 Places hidden from Google Maps Street View, paper maps purposely printed incorrectly, secret caves and real undersea cities make up the final section of this book. The author’s life sounds exciting. While some of the essays live up to that standard, unfortunately much of the book does not. 3 stars. Thanks to the publisher, University of Chicago Press, and NetGalley for an advanced copy.